The Aquarius is a large area, but rather faint constellation. Nevertheless, he is one of the oldest known constellations of the firmament and is a zodiac sign. For earlier cultures he marked the rainy season in the astronomical calendar, which gives an idea of ​​the origin of its name and its historical significance. Aquarius is best seen from August to November. 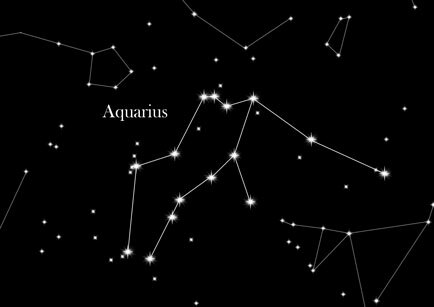 Aquarius is located south of Pegasus and is adjacent to several other constellations that are dedicated to water (Fishes, Whale, Southern Fish, Dolphin). It consists of very faint stars and is therefore difficult to recognize as a character. Beta Aquarii is the brightest star in Aquarius. His name Sadalsuud is of Arabic origin and means "the happiness of happiness." However, Alpha Aquarii has 6,000 times the luminosity of our sun, making it a true giant. According to the legend Aquarius represents Deucalion, who survived the Flood and was the ancestor of the human race. As a kind of hellenic Noah he survived the floods of the angry Zeus and saved the civilization. According to other traditions Aquarius shows Kecrops I, the founder of Athens or Ganymede, Zeus' cupbearer. In more recent times the "Age of Aquarius" was much talked about. Basis is that the vernal equinox is about to leave the Fishes and move into Aquarius due to the precession since the middle of the last century. Astrological significance: People who are born under the sign of Aquarius are considered to be gregarious and unconventional. They are rather extroverted than introverted and they are quick thinkers and not impressed by traditions. Often idealistic, freedom is their greatest asset.